Christy Angeletti has completed her latest 12 song album project with veteran hitmaker & Legends Hall Of Fame producer Robert Metzgar in Nashville. The project which spanned an entire year of intense work features the songwriting of one of Nashville's brightest young BMI songwriting stars. The album entitled "Perfectly Fine" will be out and distributed nationally in time for Fan Fair 2010. There is nothing in this world that makes me happier than my songwriting. Some of my songs are just fun songs that embrace the strength of women everywhere. My favorites are the ones with a little attitude that tell things the way they really are. 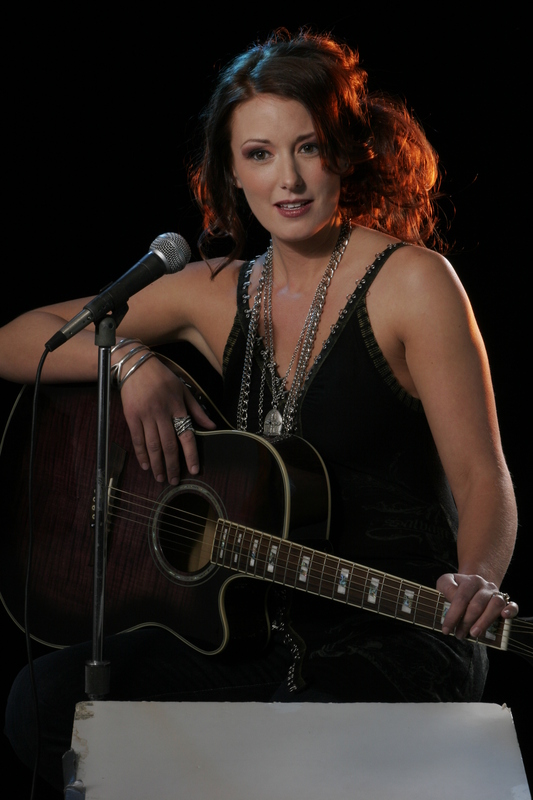 Nashville recording artist Christy Angeletti & her band have set their goals for the national spotlight in 2010. Christy is known as one of BMI's brightest & most successful young songwriting stars. Guided in the studio by her internationally famous vocal coach, Renee Grant Williams, Angeletti spent a year working on her original material. She wrote eleven of the songs on the "Perfectly Fine" album and co-wrote the last song. Her favorite songs from the album are Tough Enough, It's My Turn and the ever inspiring Perfectly Fine. Entertainment Headline News editors recently interviewed Christy Angeletti upon completing her album project scheduled for release in early 2010. Q: Christy, how old were you when you sang your first song? A: I was four years old when I sang my first song. It was in church during a preschool Christmas musical. My parents still have the video. It's fun to go back and watch that video from time to time. I have such incredible role models in my parents. They raised me with such good moral values. My parents taught me what the important things in life really are. I've worked very hard for the things that I've achieved in life and I thank my parents for teaching me the importance of doing this. My music and career would not be what it is today without the support of my family. Q: Who are some of the artists that you personally listened to as a young person growing up? A: Some of my favorite artists that I listened to growing up were Tim McGraw, Jo Dee Messina, Bare Naked Ladies, Ace of Base, Milli Vanilli (I still liked their songs) Christina Aguilera and Heart to just name a few. I have had the privilege of performing on stage with Jo Dee Messina, Daryl Worley, Josh Gracin, John Michael Montgomery, Mel McDaniels and other country superstars. I listened to all genres of music growing up. Rock, country, pop, hip-hop, and Contemporary Christian music were all on our radio. Our family just loved music of all kinds. Q: Who are some of the role models in your life? A: I have a lot of role models in my life. I can't thank my husband John Angeletti enough for all the support that he has given my music career. God, my husband, family, friends, my fans, my dogs and my music are the most important things in my life. I have a great family. My parents are very active in our lives and would do anything for their children. I have two older sisters, 13 nieces and nephews. My parents had a child in every State that they moved to. After I was born, they decided to not move anymore. We all laugh about that. Q: What is the title song for the new album? A: The title is "Perfectly Fine." We are working on the graphics for the album and mastering now. There is nothing in this world that makes me happier than my songwriting. Perfectly Fine talks about the strengths of a woman, how she discovers that strength and draws on it during life's most difficult times. The title song is very empowering. I hope it encourages women and girls everywhere to be OK with who they are and embrace it. The songs on my latest album are very close to my heart. I love to record songs that make me feel the feelings of strength, love and even help me to express my sadness. Some of my songs are just fun songs that embrace the strength of women everywhere. My favorites are the ones with a little attitude that tell things the way they really are. While the average "master scale" country album now costs well in excess of $155,000 to just get started at a label in Music City, Christy had the help and guidance of one of Nashville's veteran hit makers, long time producer Robert Metzgar about how to record an album, make a video, and get launched into the country music business. "I have been interested in a music career all my life," Angeletti told the white haired 30 year veteran of country music. Metzgar is a producer that has developed some of the biggest acts in country music in his legendary career. "Christy Angeletti is one of the greatest songwriters I have ever had the privilege of working with in this business. Her songs will last her a life time in this business," Metzgar said. Christy Angeletti recorded her first session of songs at the world famous, Chelsea Studios in Nashville where so many famous names in the music business got their start, including Alan Jackson, Shania Twain and Tom T. Hall. Her first recording session featured such famous session players as Tony Migliore, Jerry Kroon, Sonny Garrish, Jimmy Carter, Pete Bordonali and Nashville's Warner Brothers string section. Angeletti's co-producers and surrounding entourage of people who have assisted her in the project is like the Who's Who of the music business. Platinum Plus Records International is one of the largest development labels in the world and also boasts some of the most successful artists in the country music business. Angeletti's album will be in distribution early 2010. Perfectly Fine will be distributed nationally by the big four, Select-O-Hits, Trans World Entertainment, The Orchard, and Anderson. All media outlets are free to copy, reprint or use this article completely free of charge. All content and photos are available for use by radio, television and print media outlets without charge.